The Golden Specific is the sequel to The Glass Sentence and is the second book in The Mapmaker's Trilogy. Make sure you've read The Glass Sentence first because this fantasy world is a bit complex. And because you'll enjoy it. While I generally try to avoid major spoilers in my reviews, any review of a second book will spoil the first, so consider yourself warned. 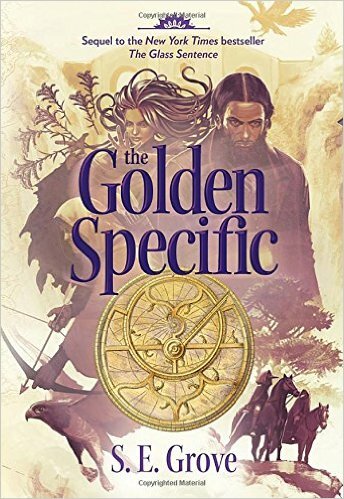 I think I may have even enjoyed The Golden Specific more than the first book. So much happens! Sophia and Theo have rescued Shadrack and are enjoying life in New Occident together. Theo has begun exploring with one of Shadrack's closest friends and Shadrack has been given a seat in the government, which leaves Sophia alone to continue the search for her parents. She finds a clue that will surely lead her to more information and when Theo returns from his expedition, they decide to travel together to follow up--without Shadrack's knowledge or permission. On the day they are supposed to leave, Theo gets caught up in a murder case and Shadrack is blamed. Unaware of the trouble at home, Sophia thinks Theo has abandoned her and leaves on a ship alone. Thus begins Sophia and Theo's separate adventures. The novel is told through both Sophia and Theo's perspectives. This lets us have more information about Theo's background and why he is so untrusting. In addition to Sophia's storyline, we also get snippets from her mother's diary from right before she and her husband disappear. Sophia befriends a couple of unlikely travel companions and learns more about mapmaking and reading as she tries to retrace her mother's footsteps. 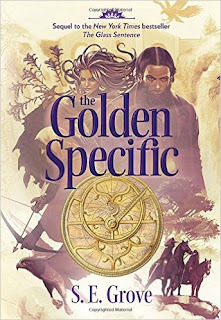 The Golden Specific is a solid fantasy novel that is entertaining and thought-provoking. Luckily for me, I had the ARC of the final book in the trilogy waiting for me when I finished this second installment. It would have been a very long wait otherwise!